I just downloaded and looked at all the photos of what we did today, my goodness we were busy! Today was a much better day for us. It’s truly amazing what a little sleep in a comfy bed will do for you. Although, I did wake up at five this morning (two AM my time!) for no apparent reason and couldn’t get back to sleep before our six thirty wake up call. Sigh…at least I didn’t run out of umph though. I know how bad my memory is so I resorted to taking notes throughout the day. I’m just going to type them up and pop some photos in if blogger will let me, then pop into bed. We have another huge day tomorrow. (Although I really don’t know what we are doing as our guide isn’t sticking to our itinerary at all.) I’ve heard rumors that we will see Mt. Vernon and the National Zoo. I guess it will be a surprise! We started out with a quick breakfast at the hotel buffet. I’m not sure if they weren’t expecting all 64 of us at once or if they were just really unprepared as they kept running out of food. Breakfast started at 7:30 and we had to be on the bus and ready to go at 8:00. It was tough, but we did it. The bus (or coach as they like to call it “in the business”) drove us though morning rush hour traffic into DC where we picked up a “City Guide”. She was amazing. She knew all sort of fascinating facts about nearly everything. .
Our first stop of the day was the WWII Memorial. It was just beautiful. 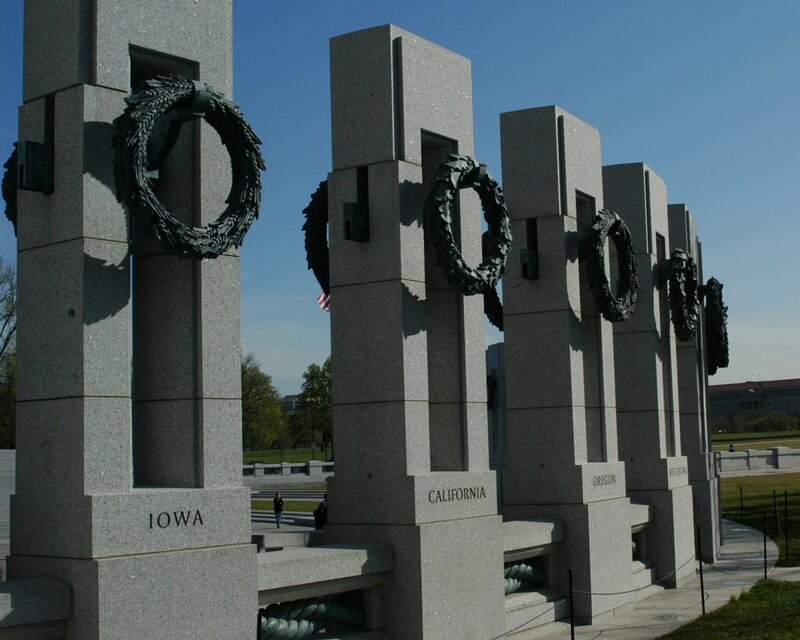 Each state and territory was represented by a granite pillar and wreath placed in a circle in the order that they joined the union. All of the states are joined together with a carved rope to represent the unity of the states. 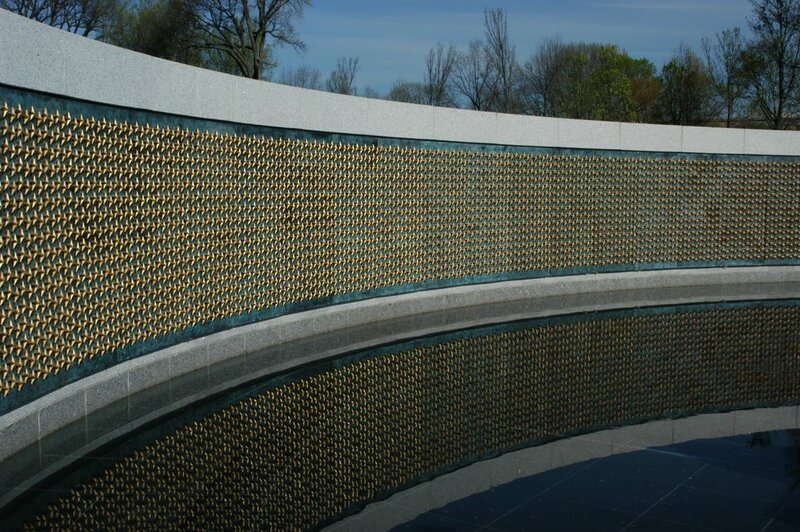 There is a wall placed behind a reflecting pool that is filled with 40,000 golden stars. Each of those stars represent 100 of the men and women that died in WWII. Seeing all those stars sunk in for me exactly how many lives were lost in the war. All in all it was a very tranquil place and a fitting memorial. We had a 10:00 appointment with Senator Patty Murray’s representatives in the Russell Senate Building. (The Senator was back home in WA on Spring Break) It was rather interesting listening to her aides and finding out a little more about what their jobs were and how Senator Murray’s office was run. The building itself was beautiful as most building in the area are. A special touch was all of the original artwork by Currier and Ives. 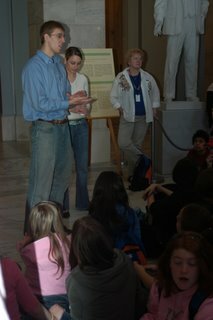 I have to admit that one of the most interesting thing about the Senate building was one of the 6th grade teacher’s finding. We couldn’t figure out which door to enter so he bounded up the stairs and into the building to ask. This made the guards really nervous. They refused to let him talk and kept directing him to put his backpack in the x-ray machine. They take security very seriously in this town. OK…I’ve only gotten through 11 or so this morning, but I think I need to get to bed. I’ll try to add more tomorrow. 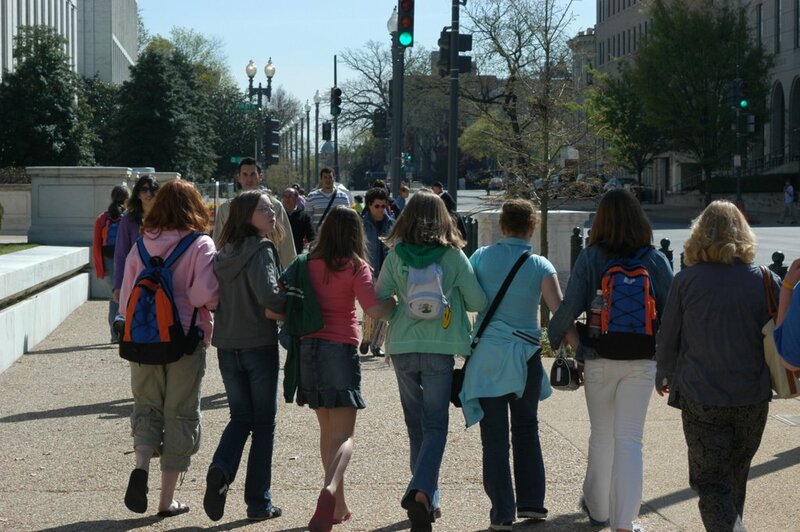 Aren’t they just so adorable walking down the sidewalk arm in arm? At least they didn’t shoot him. They have an x-ray machine installed at Heathrow which penetrates clothing but not skin, thereby allowing them to see concealed things and people naked. Given the attributes if the great unwashed, I can’t imagine a worse job than x-ray machine monitor. We don’t really realize how lax we have it over here in the states compared to what the rest of the world has.